Department of Computer Science, Houghton College, One Willard Avenue, Houghton, NY, USA. Received September 10th, 2009; revised October 9th, 2009; accepted October 16th, 2009.
and five-cycle TEAs, a considerably harder problem, which the prior GA approach failed to solve. Software Encryption workshop at Cambridge in 1994 . TEA called XTEA to address this weakness . analytic technique introduced by Biham and Shamir . 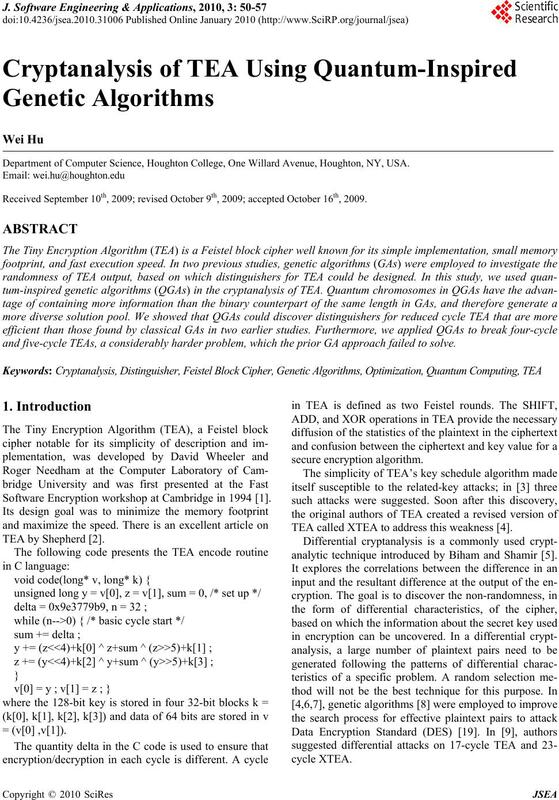 tial cryptanalysis of 12-cycle TEA and 14-cycle XTEA. provement was aimed at the key-related attacks. and for some weak keys up to 17 rounds. four-cycle TEA, which is a much harder problem. locations 0 or 1, respectively. 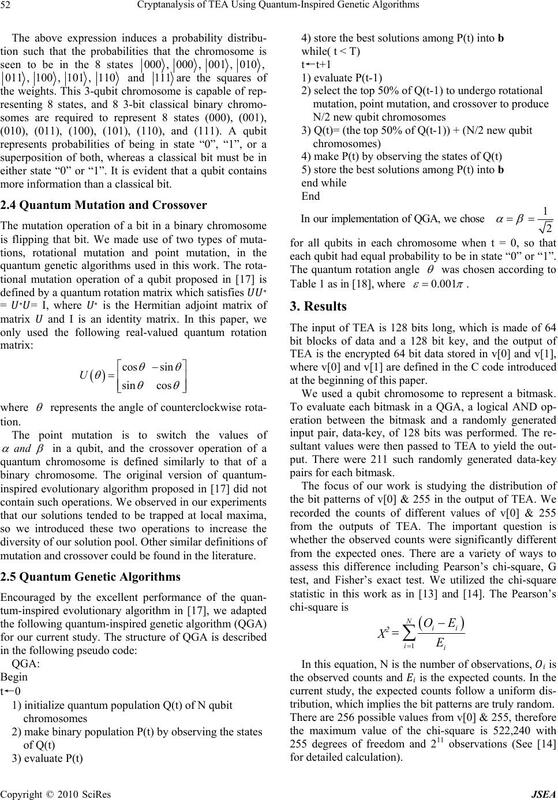 genetic algorithms in Subsection 2.5.
state “1”, or a linear superposition of the two. more information than a classical bit. mutation and crossover could be found in the literature. each qubit had equal probability to be in state “0” or “1”. 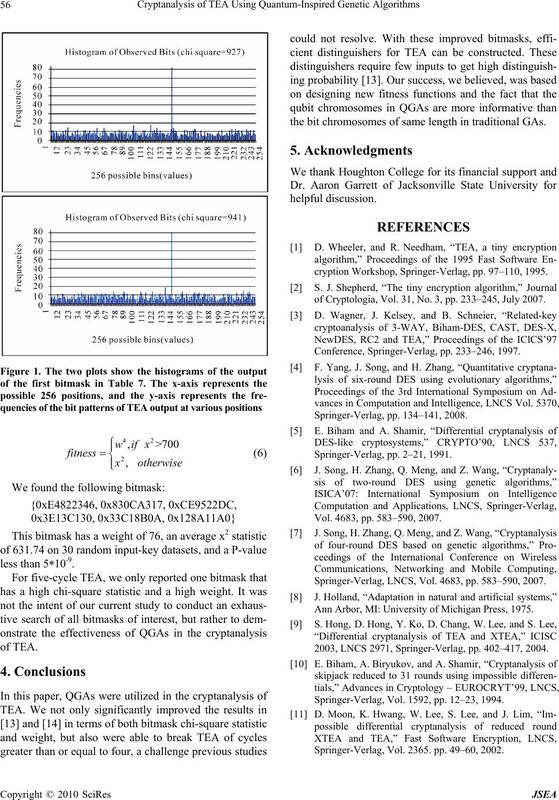 We used a qubit chromosome to represent a bitmask. tribution, which implies the bit patterns are truly random. crease the weights of those bitmasks. thresholds in the fitness function for each different cycle. 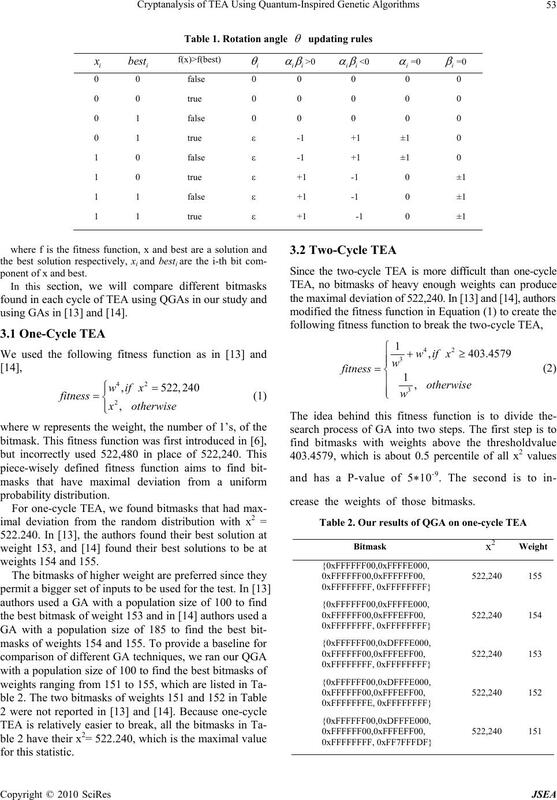 and weight are included in Table 4.
are presented in Table 5.
responding values of 420.8242 and 100.2 respectively. both chi-square statistic and weight. 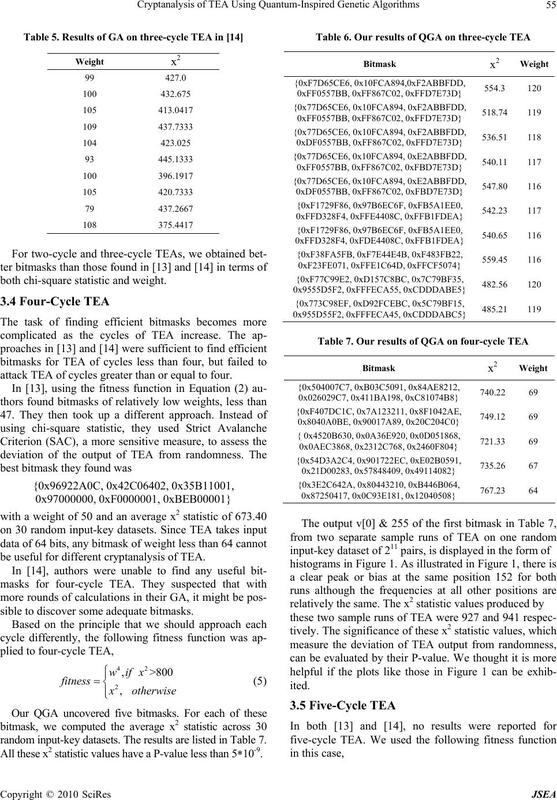 attack TEA of cycles greater than or equal to four. 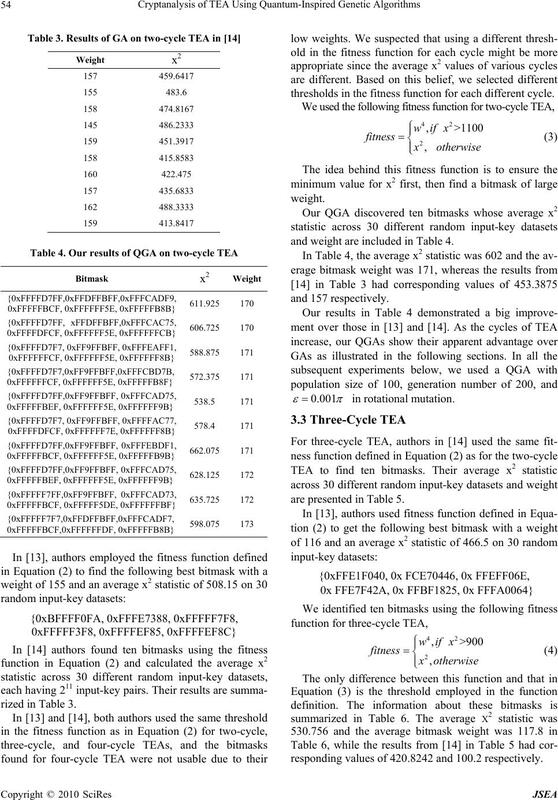 be useful for different cryptanalysis of TEA. sible to discover some adequate bitmasks. random input-key datasets. The results are listed in Table 7. All these x2 statistic values have a P-value less than 5*10-9.
the bit chromosomes of same length in traditional GAs. cryption Workshop, Springer-Verlag, pp. 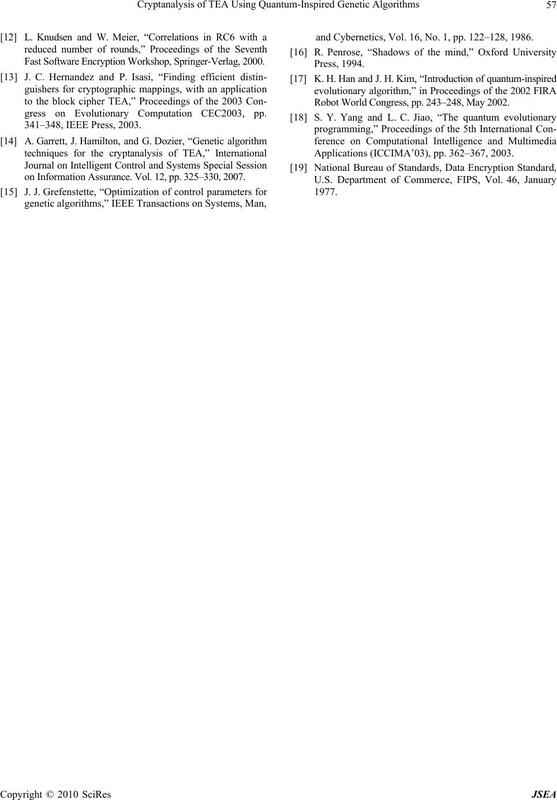 97–110, 1995.
of Cryptologia, Vol. 31, No. 3, pp. 233–245, July 2007. Conference, Springer-Verlag, pp. 233–246, 1997. Vol. 4683, pp. 583–590, 2007. Springer-Verlag, LNCS, Vol. 4683, pp. 583–590, 2007. Ann Arbor, MI: University of Michigan Press, 1975. 2003, LNCS 2971, Springer-Verlag, pp. 402–417, 2004. Springer-Verlag, Vol. 1592, pp. 12–23, 1994. Springer-Verlag, Vol. 2365. pp. 49–60, 2002. 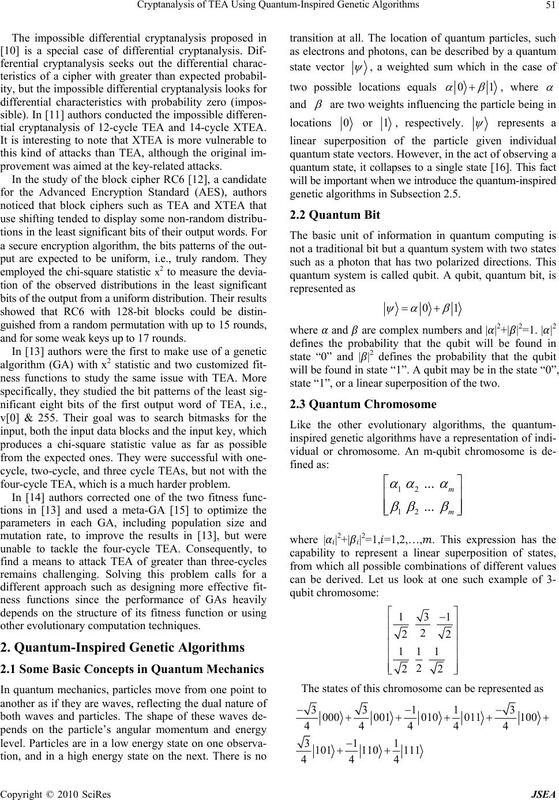 Fast Software Encryption Workshop, Springer-Verlag, 2000.
gress on Evolutionary Computation CEC2003, pp. on Information Assurance. Vol. 12, pp. 325–330, 2007.
and Cybernetics, Vol. 16, No. 1, pp. 122–128, 1986. Robot World Congress, pp. 243–248, May 2002. Applications (ICCIMA’03), pp. 362–367, 2003.